I love to cook, so I read cookbooks like they are novels. This book literally lived on my nightstand this past weekend. I picked up a copy at Costco and I couldn't put it down, so I had to purchase it. It's well worth the price and highly recommended. Williams-Sonoma produces great cookbooks and this one is exceptional. It's oversized with beautiful photographs. The topic is comfort food, so all of the recipes feature traditional American (okay, some Italian-American, some Tex-Mex) recipes with easy to find ingredients. Basically, this is a book full of recipes that you'll actually use. My mouth was watering over the Chicken Enchiladas, Buttermilk Biscuits, New York Style Pizza, French Toast with Bruleed Bananas, Chocolate Layer Cake, Sloppy Joes... I could go on and on. I'll definitely be trying some of these recipes and featuring the results on the blog. Just look at the cover! I was drooling over the pictures. I know this book would make a fantastic gift, even for someone who isn't a gourmet cook. Think about birthdays, graduations, bridal showers... Anyone who likes to eat would enjoy this book. I know you can purchase it at Williams-Sonoma, but you can probably save a few bucks by buying it from Amazon, or if you're a Costco member, it may be in stock in your local store. I love Costco cookbooks but I try to avoid that section because it gets me in trouble! 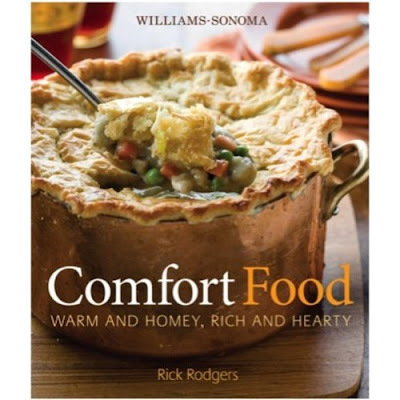 I love Williams Sonoma - I have their "soup" and "chicken" books - love love love. This one looks like one I might like too!